We spent the last quarter of 2013 developing all sorts if new activities to “fix” Internet governance, managing to thoroughly confuse ourselves in the process. A large percentage of these activities only have relatively short lives and will compete with each other for the attention (and participation) of the wider Internet governance community. In a series of posts over the next few days, I’ll look at those initiatives to see whether all the attention/panic/hand-wringing they’ve generated is warranted and see if there are better ways to approach each of the initiatives. There are only four months between now and the meeting in Brazil. It’s been just over two months since the meeting was first announced and a month since CGI.br announced that there would be four committees to organize the meeting. We’ve been told that the deadline for proposals to be discussed at the meeting is 1 March, three months from now. Since the 26 November announcement from CGI.br, however, there’s been silence. No doubt, there is lots of work going on in the background, but there has yet to be a call for nominations for the two multistakeholder committees. Experience in other Internet governance activities has taught us that it will be at least a fortnight between a first call for nominations and a final deadline for nominations (with prerequisite grumbling from stakeholder groups that they don’t have enough time to do proper consultation to identify and select the best candidates). Given we’re heading into the Christmas/New Year silly season, the earliest we’re likely to hear a call for nominations is early January. That gives the committees one and a bit months to get their act together, decide an agenda for the meeting and decide how to handle Internet governance proposals submitted to the meeting. GMMIG will be a two-day meeting, meaning there will be very little time for real discussion and negotiation between divergent views onsite. The meeting does not yet have a website. And there have not yet been any official calls to submit proposals for the meeting. What does this mean for GMMIG’s impact on Internet governance? Is the Brazil meeting, with its incredibly truncated preparation period, going to be able to achieve an agenda that not only reflects divergent views on what is important to discuss, but can also achieve the local host’s aim of “pursu[ing] consensus about universally accepted governance principles and to improve their institutional framework” in relation to Internet governance? How are potential participants going to have the time to read and fully digest what could be a substantial number of proposals in March and early April, which is a period full of existing meetings and processes in the Internet governance sphere (ITU’s CWG-Internet, finalization of CSTD WGEC report, ICANN49, the additional ITU MPP meeting for the WSIS+10 High Level Event)? If the meeting does result in a consensus on “universally accepted governance principles and [how] to improve their institutional framework”, how legitimate is that consensus, given the limits placed on the number of people who can attend? Do we end up with another optional opt-in set of principles, like the OECD Principles for Internet Policy-Making? I suspect that with only two days, the best that the meeting can hope for is a very high level, generic set of principles. They may be useful to the extent that the pro-multistakeholder Internet crowd have a statement from a very big government-hosted event to back up their beliefs in bottom-up, participatory Internet governance. But if we look at the OECD principles, have we seen anyone amend their policy-making processes, or stamp their existing policy-making processes as “OECD compliant”? The meeting is outside the UN framework, so will not have the same level of gravitas that, say, a statement from the 2015 WSIS+10 review can have. The Brazil meeting also does not have a clearly identified and committed community that will go away after the meeting and implement the governance principles, in the same way that IETFers will implement specifications documented in an RFC. If GMMIG’s outputs are likely to be limited, should we invest our time in it? Yes, but I’d suggest that we start to view it as a long-term process and not a hectic process lasting only a few months in early 2014. What I believe is important about GMMIG is that it will probably begin a long-term series of government-hosted meetings that support the multistakeholder principle and look for ways to improve it. OECD and the European Commission have held some interesting meetings related to Internet governance issues, but the fact that most of the countries involved in those meetings have been from developed, not developing, countries, has limited how well the outcomes and recommendations from those meetings are perceived in the developing world. As I’ve stated in a CENTR paper that is due to come out later today, I believe that the announcement that France is now a co-host of the meeting could be an indication that France will host a follow-up meeting on its territory a year or two in the future. We’ve seen this happen with the 2011 London Conference on Cyberspace, which then led to the 2012 Budapest Conference on Cyberspace and this year, to the 2013 Seoul Conference on Cyberspace. What is also very important about GMMIG is the way a country outside the usual—to use a UN term—WEOG (Western European and Others Group) crowd is leading the process. It’s good to see a country like Brazil being proactive and leading the initiative to help reframe Internet governance. Contrast this to a number of countries in the UN space who prefer to complain about unfairness and the disparity of Internet development in different countries, but see the answer as getting funding from developed countries and interventions via UN bodies rather than being proactive about making changes themselves. What is also important about GMMIG, and sets it apart from the “movement” that is 1net, is that it has governments as active members of the dialogue. GMMIG was original scheduled to happen after the ITU WSIS+10 High Level Event. However, with the High Level Event now being moved to later in the year, and an additional MPP meeting for the High Level Event being added in April, GMMIG can be an influence on the documents for the WSIS High Level Event. Finally, GMMIG is part of a long-term Internet governance dialogue. That dialogue started in earnest around the time of WSIS in the early 2000s and has ramped up again in the last couple of years as preparations for deciding the agenda for WSIS next 10 years began. The Internet governance community needs to stop focusing on specific events (WCIT, WSIS+10, ITU Plenipotentiary) as “threats” and instead focus on improving the overall system of Internet governance. The problem with focusing on specific events is that the much of the community tends to collapse in an exhausted heap after each event, pat itself on the back, saying to itself “Phew, dodged a bullet there! Aren’t we lucky we saved the Internet from bad decisions at [latest evil event]?” But by seeing the threats to Internet governance as external time-delimited forces, we fail to see the threats we pose to ourselves. 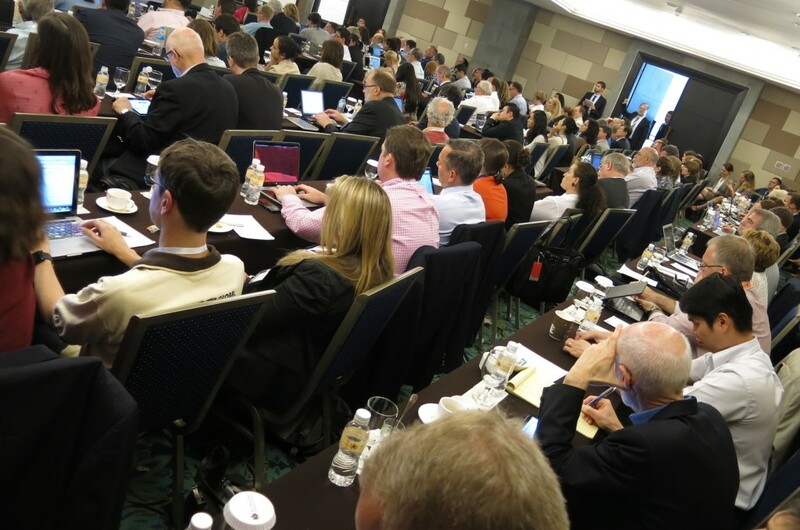 Sure, we need to take notice of events like ITU’s WCIT and this upcoming GMMIG in Brazil, but we also need to be mature enough to keep a constant eye on our own processes, our own organizations, and be open to criticism at all times—not just in the lead-up to specific global meetings. On 7 October 2013, the Montevideo Statement on the Future of Internet Cooperation was published. On 10 October, the Global Multistakeholder Meeting on Internet Governance (GMMIG) in Brazil was announced. On 23 October, during a lunch break at IGF 2013, a very packed room listened to a rather confusing mixture of explanations from various I-Star leaders about the Montevideo Statement, the Brazil meeting, what was happening to what had formerly been known as ICANN’s 5th Strategy Panel on the Role of ICANN in the Future of Internet Governance, and the vague website called 1net that had mysteriously appeared in the days leading up to IGF 2013. Standing room only at IGF 2013 lunch meeting as IGF participants crowd in to hear about the Brazil meeting, the 1net initiative and more. Almost a month later, on 17 November, ICANN issued an announcement updating people on what had previously been ICANN’s 5th “Strategy Panel on the Role of ICANN in the Future of Internet Governance” and was now known as the non-ICANN-branded “Panel on the Future of Global Internet Cooperation”. The title of the press release called it a “High Level Panel” that would address “Internet Governance”, adding some confusion to what the panel’s real name was. Further adding to the confusion was the fact that the Civil Society Internet Governance Caucus began using “HLLM” to refer to this panel. HLLM (High Level Leaders’ Meeting) was the name of the IGF 2013 pre-event that had, at IGF 2012, been called the High Level Ministerial Meeting (HLMM). On 20 November, at the ungodly hour of 7 am, ICANN 48 attendees met to hear the I-Star leaders clarify why they had written the Montevideo Statement, were supporting the Brazil meeting, and wanted the community to join 1net (which still had a very vague website and a mailing list—with the name of i-coordination—that failed to sign up a lot of the people who had signed up for it… which wasn’t helping public perception of 1net as aiming to be an open, bottom-up process). In response, the ICANN community decided to add yet another group into the mix: the Cross-Constituency Working Group (CCWG) on Internet Governance. The idea was to use the CCWG to break down the usual ICANN constituency silos and channel ICANN community input into 1net, which, in turn, would feed its input into the Brazil meeting (GMMIG). Have you got all these groups and meetings mapped out in your head clearly now? No? What’s wrong with you? Keep up! Anyone else notice the alarming similarity to Einstein’s equation, E=mc2? Is this a veiled reference to needing an advanced physics degree to understand how all these new Internet governance committees and groups relate to each other? Not to be confused with the ICANN GAC. It’s quite simple really. One is the Governmental Advisory Committee and the other is the… Governmental Advisory Committee. Hmmm. Oh well, just stick GMMIG in front of one—GMMIG GAC—and ICANN in front of the other—ICANN GAC—and all will be clear. At this point, I’m sure that many people in the Internet governance world were only pretending to have an understanding of the mushrooming set of groups and committees and name changes for said groups and committees. On 13 December, the panel formerly known as the ICANN’s 5th ICANN Strategy Panel on ICANN’s Role in the Future of Internet Governance, the panel that, at the start of the day was called the Panel on the Future of Global Internet Cooperation was, by the end of the day, renamed the High Level Panel on Global Internet Cooperation and Governance Mechanisms. Or HLPGICGM, if you like unpronounceable acronyms. Or to make it pronounceable, maybe add some vowels: HLPoICaG. Nope, that didn’t help. To confuse matters, though, while the heading of the panel’s press release called it a “High Level Panel”, the text of the release only called it the “Panel on Global Internet Cooperation and Governance Mechanisms”. How did we end up in this state? Seriously, Internet community people. Can we take a minute to just think about all of this? I understand the desire to find ways to improve Internet governance mechanisms in ways that help address all the criticisms that have been flung in the direction of the current Internet governance ecosystem. But is creating a plethora of new committees, panels and groups, giving many of them completely non-memorable names, thinking twice and renaming them to even less memorable names… is this really helping? If we are confusing ourselves with all of this, how on earth do you think it looks to outsiders? To those governments and other critics of the current Internet governance system? 1. People with communications expertise aren’t being involved. This was evident to me when the Montevideo Statement came out. That thing is not a statement. It’s a press release about a statement that actually hasn’t been written. If you don’t involve people who understand communications, you end up with panel names like (High Level) Panel on Global Internet Cooperation and Governance Mechanisms. Sure, that panel name very accurately describes exactly what the panel is going to discuss. But who is going to type out a panel name that is 74 characters long? Who is going to say the name out loud when it is 24 syllables long? Instead, if the panel is lucky, the general community will shorten it to “High Level Panel”. The downside of this is that the panel’s name becomes decontextualized and emphasizes the top-down nature of the panel’s composition. If the panel is unlucky, people will continue to refer to it by other names: “the panel that used to be the 5th ICANN panel”, “that other panel, you know, the one that’s not the Brazil meeting or the 1net thing”, or, using the hashtag the panel uses (#internetpanel), “the Internet panel”. The downside of this variety of names is that the panel fails to have any sort of uniform identity in the community. If “Internet panel” becomes the norm, it could make it sound like it’s the new ultimate source of Internet decision-making, attracting the wrong sort of attention to its activities. Lack of communications staff in the various processes is also apparent in the lack of any clear documentation about pretty much all of these initiatives. Sure, there’s a need to get the community’s input into these processes, but given the proliferation of activities, it would help the community know where to focus their attention if they had a clear picture of how all the pieces fit together. 2. Everyone sees a problem. Everyone has come up with a different idea for fixing it. Yes, Internet governance is in need of a bit of re-boot. It’s great that so many people and organizations are recognizing this. What’s not so great is the fact that there’s not a lot of time before the 10th anniversary of WSIS in 2015 and there’s not enough coordination between all these people and organizations with great ideas. Add into the mix the poor utilization of the skills of communications staff, and you also have the problem of bridging the gap between the originators of initiatives and the communities they hope to involve. I’ve used humour in this post to highlight the lighter side of the confusing array of processes that have begun in the last few months. But it’s also a very serious issue. As Internet governance undergoes its version of the Cambrian explosion, we need to ensure we emerge with a diversity of structures and processes that help, rather than hinder, Internet coordination and development long-term. Unfortunately, the Law of Complexity suggests things get more complex—not simpler. When you break a plate, you could try gluing it back together again, but all you end up with is a bunch of shards glued together in a plate-like shape. It’s not the same plate it was before it broke. Similarly, we are not going to be able to un-create the new and overly busy little world of late-2013 Internet governance initiatives. But it is possible to make it more accessible. We’re seeing on the 1net mailing list an absolute flurry of passionate people saying what they think should happen/should have happened/should not happen. 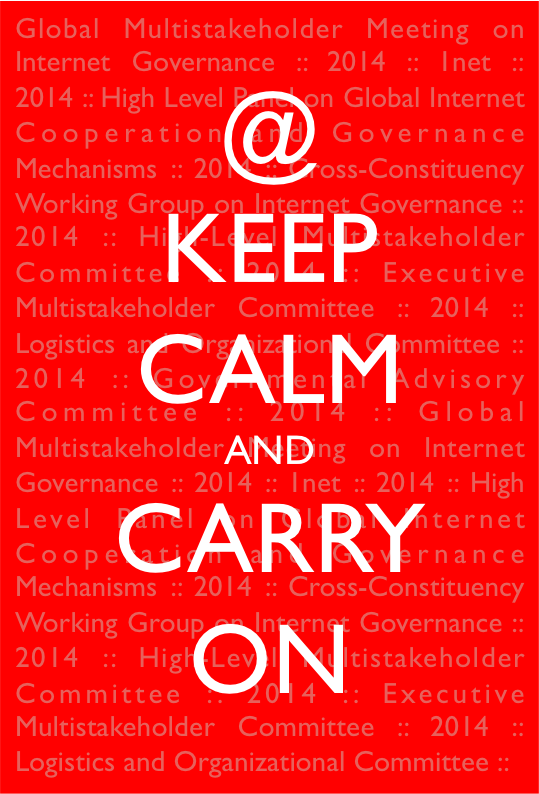 It’s also happening on the Civil Society Internet Governance Caucus and Best Bits lists. But right now, it’s pretty much impossible for anyone to follow all of the mailing lists that are discussing Internet governance, let alone have the time to contribute well thought out opinions to the debates. What’s needed now is for Internet technical organizations to use the skills of their plentiful communications staff to produce clear, easy to understand information that allows people to participate when issues of interest to them arise. This is starting to happen, but it needs to happen more, and communications staff need to be front and centre whenever any of the initiatives release new information. Having a random leader of an I-Star organization write a blog post or email to a mailing list in their personal capacity, expressing their own view on what’s happening, is not enough. Yes, the Internet governance model is a bottom-up and multistakeholder, but when confusion abounds, as it currently does, there needs to be clear, high-level documentation available. Even if such documentation could only show decision trees, it would help the community understand where we are and what decisions need to be made. Stage 1 of “Operation Re-boot Internet Governance” (ORBIG?) has been accomplished: the people have been awoken. We now need to accomplish Stage 2: give people the information they need to participate. Without that information, people become frustrated and destructive. We’ve seen that happening in the last couple of months. We only have four months until the Brazil meeting and perhaps 18 months until the final review of the WSIS outcomes. Policy-related folk are clearly key players in Internet governance, but if we don’t take advantage of communications folk, a couple of thousand policy folk will remain stuck in the tangle of processes and committees and mailing lists, trying in vain to figure out where to best focus their attention. Important: This is not the statement that the I-Star leaders wrote. This is what I wish they’d written if they’d taken the time to consult with one or more of their communications or policy staff first. 8. Call for the transition to IPv6 to remain a top priority globally and, in particular, Internet content providers must serve content with both IPv4 and IPv6 services, in order to be fully reachable on the global Internet.